Published: Nov. 10, 2014 at 01:07 a.m. Updated: Nov. 10, 2014 at 07:26 p.m. The waiver wire is one of the most important keys to finding success in the world of fantasy football. Each week, I'll offer up 10 players you need to target off the free-agent market as you look to reach your ultimate goal -- winning a league championship! And if you play in a deeper, or highly competitive league and all 10 of these players are already owned, be sure to check out our weekly deep dive waiver wire targets for some high upside players to aim for heading into Week 11. I typically don't include players owned in more than 60 percent of leagues, but I'm making a few exceptions this week. 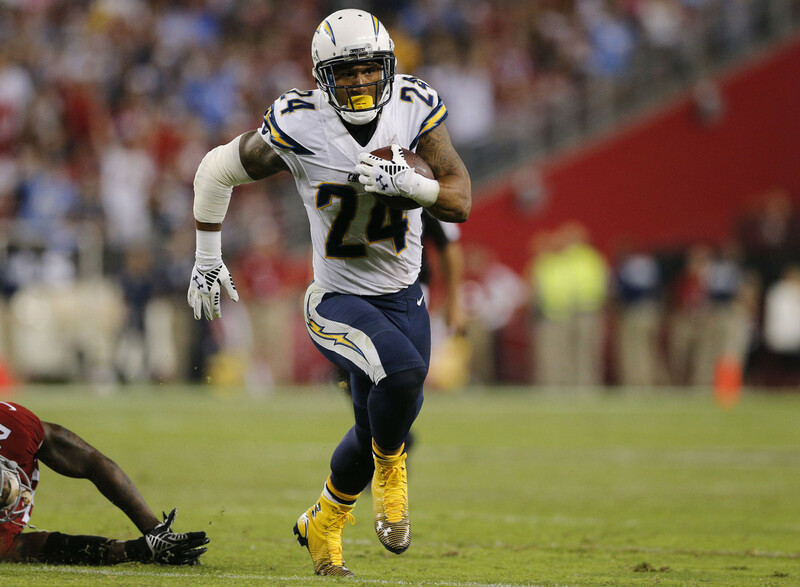 One of those is Mathews, who has been out several weeks with an injured knee but could be back in action in Week 11. When you look at how Branden Oliver's numbers have dipped, Mathews could easily regain the top spot on the Bolts' depth chart once he's back. Over the last four weeks, few wide receivers have been hotter than Bryant ... but he's still not owned in a ton of NFL.com leagues. That should change after Week 10 though, as he went off for 143 yards with one touchdown and 20.3 fantasy points in a loss to the New York Jets. Bryant has now found the end zone six times in his last four contests and needs to be owned in all leagues. Gordon is eligible to come back in Week 12, so he needs to be owned in all leagues. I realize that some leagues out there might be "dead," but the fact that he's still a free agent in almost 60 percent of NFL.com leagues is criminal. Unless you don't want to win your league's championship, well, what are you waiting for? The time to strike is now, so check to see if Gordon is available. Peterson's situation is fluid, but NFL Media insider Ian Rapoport told me there's a chance that the veteran running back will return in December. Imagine if that comes to fruition, and you have a superstar like Peterson for the fantasy postseason? If he's a free agent in your league, it's time to add and stash him in the event that he comes back for the final weeks of the 2014 season. If you're in a PPR league and need a wide receiver, you need to see if Bowe is still a free agent. The veteran put up 17.3 PPR points in a win over the Buffalo Bills in Week 10, and has now scored at least 11.5 PPR points in each of his last four games. His lack of touchdowns makes him a less favorable option in standard formats, but Bowe's high reception totals make him a PPR starter. The Redskins are coming off a bye, so Griffin III wasn't added in a whole lot of leagues. However, he's now worth a look off the waiver wire if you need a quarterback based on what is a favorable matchup against the Tampa Bay Buccaneers. Their defensive unit has struggled to stop quarterbacks on the road in 2014, allowing an average of over 21 fantasy points per game to the position. Mason isn't putting up huge numbers, but that's due in large part to the fact that he's faced some difficult matchups in the last few weeks. The reason fantasy fans should be adding him is because he is now the top runner in St. Louis ... at least based on the number of touches he's received. Mason is also a nice add for owners who want to create backfield depth for the final weeks. The Broncos limited Ronnie Hillman (foot) in Week 10, leaving Anderson to see a whole lot of backfield work against the Oakland Raiders. He made the most of his opportunities, posting a touchdown and over 22 fantasy points. That makes Anderson well worth an add, though the return of Montee Ball (groin) could cloud the entire Broncos backfield in the weeks to come. Rivera has a little something going on with Derek Carr, as the two have formed quite a connection in recent weeks. In his last three games, Rivera has scored a combined three touchdowns and double digit fantasy points twice ... that includes a solid 12.4-point performance in a Week 10 loss to the Denver Broncos. If you need help at the tight end position, he's a free agent in most NFL.com leagues. The tight end position is paper thin right now, so owners who need help should add and stash Rudolph. He's still on the sidelines due to an injured groin, but the Notre Dame product could be back on the gridiron as soon as Week 11. Most owners won't be looking at Rudolph since the Vikings were on a bye, so get ahead of the game and grab him before he's in the news and off the board.